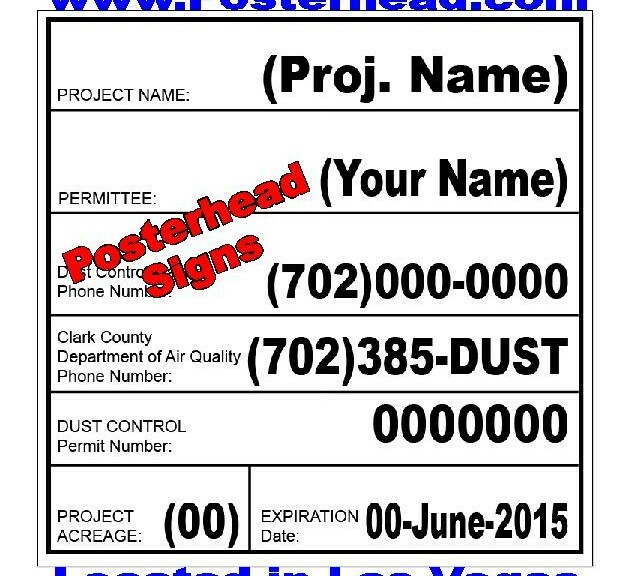 May 29, 2016 Robert W.
Dust control signs Las Vegas Nevada are mandatory for certain construction jobs by the Clark County Air Quality Management Board. The main website is www.clarkcountynv.gov and from that you can find the Air Quality Management Board to determine if your contraction project requires a dust control permit. Generally speaking, if the construction project is 10 acres or less and a dust permit sign is required, a 4ft x 4ft dust control sign is required. For projects large r than 10 acres, a 4ft x 8ft dust control sign is required. These signs have certain requirements of text and size as required by the Clark County Air Quality Management Board. Dust control signs Las Vegas Nevada are not that expensive. In the old days, heavy wooden signs were the norm and they required much prep work to make your sign. With new materials being available, a lightweight, but yet sturdy aluminum sign is more affordable and easier to install. Generally, construction people place a few 4″ x 4″ posts into the ground deep enough( so that the sign will not blow over) and simply attach the aluminum sign to the posts with screws and washers. The posts are not cemented in case the sign needs to be moved for construction reasons. The larger 4ft x 8ft signs are put up with 3 4″ x 4″ posts and sometimes a cross brace in high wind areas. The aluminum signs handle the weather conditions of Las Vegas better and are since they are lightweight, they are easier to work with and can be put up with one man instead of 2. Dust control signs Las Vegas Nevada are not expensive. The 4ft x 4ft sign ( which is used most often), sells for $99.00 and the larger 4ft x 8ft dust control sign costs around $175.00. These dust control signs can be purchased at local sign shops in Las Vegas. May 20, 2016 Robert W.
Las Vegas double foot 33″ x 81″ retractable banner stand is very popular as a economy graphic to help with presentations at meetings and conventions. These affordable graphics are 33″ wide by 81″ tall and come with a convenient carrying case that fold up into a compact graphic. Las Vegas double foot 33″ x 81″ retractable banner stand is less than $60 and can be used several times at different events. These graphics roll up into a compact case and can be set up in about 2 minutes with minimal effort. When placed side by side, they can look like one graphic and act as one big display. These graphics are printed on a 13 ounce matte banner material with inks that are designed for both indoor and outdoor use that will allow the graphic to withstand discoloration from the sun. 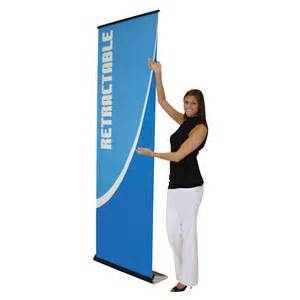 There are many different types of retractable banner stands that allow the end user to do different things. Wider and larger banners stands are available as well as smaller width stands. The most common size banner stands are the 24″, 33″ , 36″, and the 48″ wide stands. They also come in different heights as well as bases. The double foot banner stand has two feet that the stand balances on while there are heavier bases available like the deluxe base. In addition, they also make an adjustable banner stand that allows a banner stand to have different heights in case your graphic needs a wide base but less height on the upright banner. Double foot 33″ x 81″ retractable banner stand only takes a few days to make and have ready for your presentation. These stands are kept in stock because Las Vegas is the “Trade Show and Convention” capital of the world and these retractable banner stands are always in high demand because of the cost and the professional appearance they lend to the presentation. May 15, 2016 Robert W.
Las Vegas 31″ x 81″ retractable banner stands are being used at business presentations, trade shows . conventions and at events throughout the Las Vegas area. These popular retractable banners stands are inexpensive and offer a professional appearance. The Las Vegas 31″ x 81″ retractable banner stands take a 31″ x 81″ banner that attaches to a double foot banner stand with a fixed pole system. The material used is usually a matte banner material because it is log glare and will not reflect camera flashes or lights if a picture of it is taken. Las Vegas 31″ x 81″ retractable banner stands are one of the most popular graphics that are used at trade shows and conventions in Las Vegas. The reason being is that they are very compact ( they roll up into a case and come with a convenient carrying case) and can be easily transported. The set up time is less than two minutes and they can be placed side by side to look like they are one graphic and can make for a very impressive graphic wall. Three of these retractable banner stands placed next to each other constitute an approximately 10foot wise wall by over 7 feet tall. These retractable banner stands are also cheap and inexpensive. The lead time to create these retractable banner stands 9 also known as pop up banners and vertical banners is only a few days. In a rush, a sign shop may be able to produce them in a single day. There are many sign shops in Las Vegas that have the capacity to make these retractable banner stands in a hurry. If you find yourself in need of a retractable banner stand, please contact one of the many sign shops in Las Vegas to assist you in producing one of these inexpensive graphics. Be sure to ask for a quantity discount if ordering many. May 14, 2016 Robert W.
Banner printing in Las Vegas is available at very competitive pricing due to the fact that Las Vegas is the sign capital of the world. Banner printing in Las Vegas allows for a business to advertise their products to consumers through large banner advertising that can be seen very easily. These banners are hung at businesses locations so that they can be seen by thousands of people that travel by the store everyday. Vinyl banners are an effective form of advertising. Thousands of vehicles every single day traverse the roads of Las Vegas. Traffic studies indicate that that vehicle traffic is growing every year. Of course, for those that live in Las Vegas, that is not new news. Residents can just drive down the streets and notice the increased traffic. Businesses are learning to put vinyl banners at their store locations so that they can be seen by people travelling by. Some place these banners on their building and others place them on their fences and other structures to get noticed. For those fortunate businesses that are adjacent to the very busy freeways in Las Vegas, they are placing very large banners that at as billboards on their buildings that are being seen by the thousands of people who commute on the freeways. Of course, there are no monthly rental fees like you have with billboards. Large banners can be purchased in Las Vegas through sites like www.LasVegasLargeBanners.com . Banner printing in Las Vegas can also print those special event banners, school banners, sports banners and a variety of other banners for that special holiday or event. Banner printing in Las Vegas is available at many sign shops in the Las Vegas area. Simply do a online Google search or telephone book search and find a local sign shop that can assist you in making the special banner for you. May 5, 2016 Robert W.
Henderson Nevada construction signs can be made by local sign shops in the Las Vegas area at reduced prices. These construction signs are generally made with aluminum so as to be able to last in the different seasons of Clark County, Nevada without rusting. There are many different signs that constitute Henderson Nevada construction signs. The construction signs include, but are not limited to, safety signs, dust control signs, dust permit signs, no trespassing signs, do not enter signs, etc. Henderson Nevada construction signs are made with different thicknesses of aluminum. Dust control signs and no trespassing signs are being made with a double sided aluminum panel with a filler substance that offers the aluminum panel rigidity and firmness that does not allow the panel to bend. This double sided aluminum panel ( even with the filler substrate) is far lighter than the old wood type signs that are subject to weatherization. The lighter panels are more durable and easier to handle and are superior to the old wood construction signs. Aluminum paneled signs will not rust in the outdoor weather of Las Vegas. Dust permit signs and other types of construction signs are not expensive. The cost of a 4ft x 4ft dust permit sign is less than $100 and if a larger 4ft x 8ft dust control sign is needed because of the size of the project, the price is $175.00. Further information on dust control signs can be viewed at the Air Quality Management website, www.clarkcountynv.gov/airquality A 18′ x24″ no trespassing signs can help save property from vandalism, it can also help relieve liability. Contact your local sign company in Las Vegas and see how Henderson Nevada construction signs can increase your liability at a low cost. Buy local and support your local businesses is a good motto to have.